Throughout his different roles for Celebrity Cruises, Lawrence Perkins has travelled all over the world - most notably shark diving in South Africa. I was offered a job with Celebrity Cruises in my final year of university, and joined Celebrity Century as Guest Relations Officer in October 2014. Towards the end of my first contract I was asked to stay on the Century to take the ship through to her new company, a Chinese based Cruise Line, partially owned by Royal Caribbean. During the opening of Skysea Cruises I was promoted to Documentation Officer. I joined Celebrity Constellation in the Mediterranean for two months as a Documentation Officer after my vacation and was then transferred over to Celebrity Millennium in Asia. Managing disembarkation and embarkation in different ports of call all over the world, with constantly changing staff members and external factors, but still maintaining Celebrity Cruises standards, has to be one of the hardest parts of my job. We use agencies to operate our check-ins, so we have to rely on them to undertake training and ensure that their staff know what they are doing. Some of our turnaround ports are better at this than others, so ensuring that the ship sets sail with a correct guest manifest can be difficult. Travelling is my passion, and it has to be one of the best things about working on a cruise ship because you are in a different port every day. I’ve been lucky enough to do some amazing things while working on ships including shark cage diving in South Africa, ATV’ing in Santorini (Greece), diving in the Great Barrier Reef (Australia), and visit some incredible countries. Just like every line of work, you need experience in the area you will be applying for. 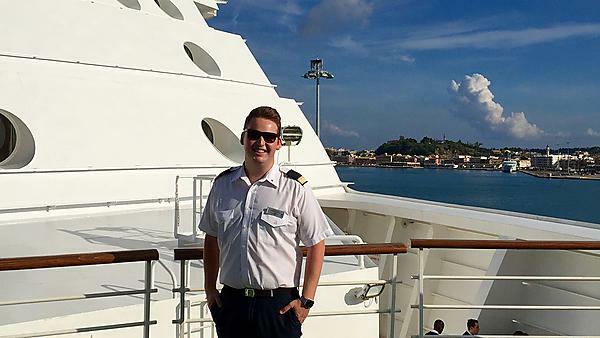 As part of my University course, I undertook a placement year with another cruise line. I think that opened up a lot of doors for me. My advice would be to take advantage of your placement year, and use it to gain as much experience in as many different areas and fields as possible. Plymouth got me ready for the real world, my course was based on work-based learning which gave me the opportunity to gain experience in the areas that interested me, and having lecturers who were engaging and friendly was really helpful as this made me feel that I could always go to them for help. I keep in touch with lots of the friends I met at Plymouth, through working at the Students' Union, and on my course. I also stay in touch with my lecturers, and as Plymouth University are now sending placement students to Celebrity Cruises I am getting to meet current cruise management students on-board our ships.